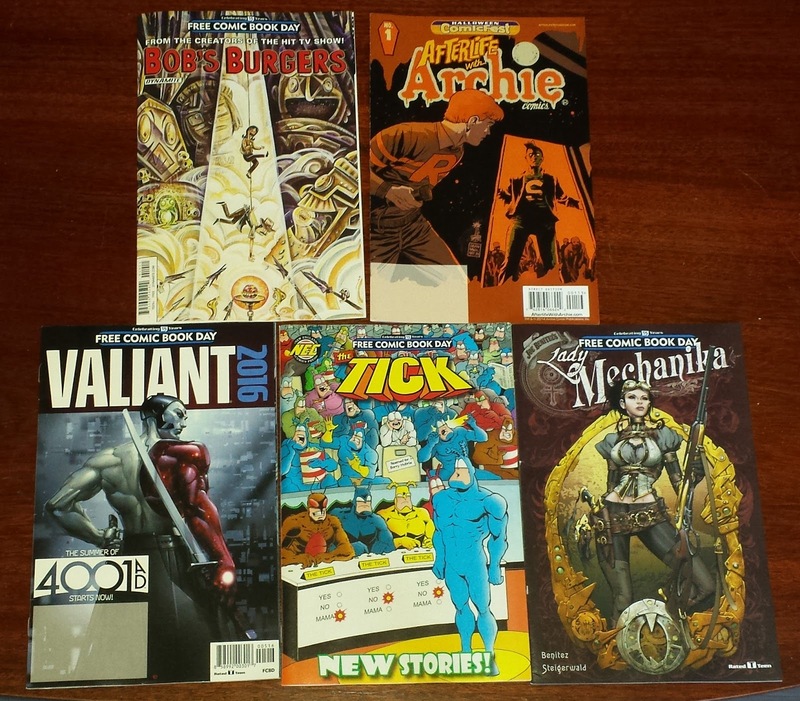 In this, the fifteenth year of Free Comic Book Day, I was able to get five separate comics at two of my local shops. One shop is very close but I don't actually shop there. It's a very small spot in a touristy zone run by a lone gentleman and stocks nearly exclusively DC and Marvel. The only non Big 2 books are of the Spongebob or very well known IDW property varieties. At this establishment, I was able to get three books. It was a madhouse. More people than I would have guessed possible were pressed inside. The other shop I went to was my main store, the store at which I have my pull. I head there every Wednesday and I don't need to give my name for my admittedly few titles. It is far larger and has a wide variety of companies and offerings. It was an absolute zoo. They had a table outside with four workers behind and stacks of comics in front. There was a nice crowd at the table, and as I approached the closest guy bagging was directing everybody inside. "Get your tickets at the back of the store..."
Inside were more people than the sum of everybody I've ever seen in there in all my trips over the last fourteen months. I greeted the one guy who's a Valiant homer like me, "This is nice, right?" He looked at me like I was insane. "You like crowds?" "In here, every once in a while, sure," with a smile is the only way I could think to answer. I used to live in Brooklyn, so I'm okay with crowds. The "ticket" was one of those raffle tickets with some code marked on it. The code let the folks know how many comics to let you have. I had been allotted two, and took a minute to make my choice. 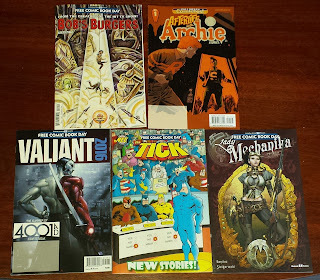 What this site is dedicated to is the discussion and highlighting of comics that are from Beyond the Big 2, and I like the fact that my comic haul from FCBD 2016 shines a light on the exact topics about which I wish to address. The long winded lead in discussion is kinda my thing, a participatory journalism deal in the vein of Hunter S. Thompson. I like the small details of the scene. Here is a picture of this year's haul with the two from Pulp Fiction Comics (on Clark in Long Beach and my main store) on top and the three from Shoreline Comics (in the Shoreline Village area of Long Beach) on the bottom. Dynamite Entertainment is one of the bigger comics publishers living out on the margins, and they can get that big because of finding success with Licensed Properties. I am a fan of Bob's Burgers the TV show, but I have yet to make a purchase any of their various titles. I'm not sure if I own any Dynamite books, now that I think about it. I saw this cover months ago and thought it would be fun if I had a chance to grab it. The chance arose and the grab occurred. Inside there are tiny snippets drawn by two separate artists, with obviously different drawing styles, and both obviously different than the look of the animated television show. Archie Comics was better known as MLJ back in the thirties, forties, and fifties and, back then, would never be mistaken for anything resembling "independent" or "an outsider." I have a whole rundown on Archie books coming up so I won't waste time with that now, but I found it interesting that this is actually not a FCBD offering. This is a Halloween giveaway from 2014, itself a reprint of their Archie-and-Jughead-are-zombies story line. This special has a very short and non-essential lead-in to Valiant's 2016 summer event, 4001 AD. AKA: six pages of new Rai content. There are a few pages of previews from some of their well known material: Divinity, Faith, Archer & Armstrong and Bloodshot, but only the Bloodshot content is upcoming. Valiant is one of the only independent Cohesive Universes available to fans. I'll have plenty to say about this company. This is actually the book that got me to plan a Saturday weeks in advance. This is another thing that interests me about the field. Joe Benitez is a writer and artist and has created a fully realized vision. He seems to be able to make a living with his steampunk Victorian-era material. When I get to comic conventions I try to find and support the really marginalized publishers, and in doing research for this web-site project, I came across one Joe Benitez and his most famous creation, Lady Mechanika. This year at FCBD, I came across the work and could put my hands on it without needing to buy it, which illustrates the power of the free comic movement.